Hotel "Harmony" is located in the Working Corner of the city. 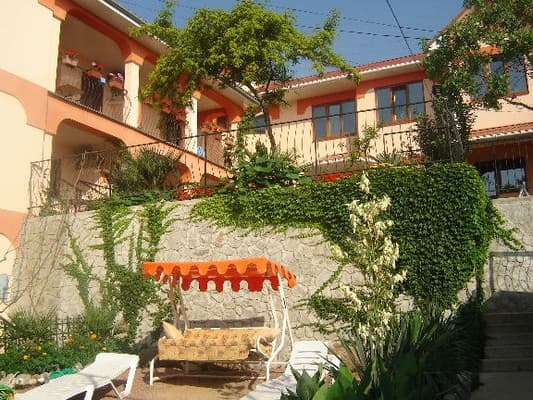 Alushta, is located 300 meters from the sea, away from the road, close to the forest zone. "Harmony" is snugly hidden from prying eyes. The surrounding area is the park area of ​​the sanatorium "Alushta", with its amazing park, as well as pine trees that create a fertile healing air. 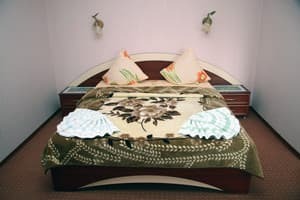 The rooms have all the amenities: hot water round the clock, shower, toilet, TV, refrigerator, satellite TV, air conditioning. Good furniture (bed, sofa, wardrobe). Each room has a balcony with a sea view, a safe and free WI-FI. For the guests of "Harmony" on a cozy and well-groomed territory there are swings and deckchairs for rest, barbecue for shish kebab. The guests are provided with: a swimming pool located in the park of the Alushta sanatorium, tennis courts, volleyball and football grounds, table tennis, children's playground. PRICES MAY CHANGE, YOU NEED TO RECEIVE INFORMATION FROM THE OPERATOR! Description of the room: One room includes accommodation of 2 people with the possibility of extra bed. The room has good furniture (bed, sofa, wardrobe), hot water round the clock, on the balcony a table with chairs. Description of the room: Cozy triple room. The room has good furniture (bed, sofa, wardrobe), hot water round the clock, on the balcony a table with chairs. Description of the room: The new one-room has a double bed, hot water around the clock, on the balcony a table with chairs. Description of the room: Two-room interconnecting rooms can accommodate three, maximum four people. 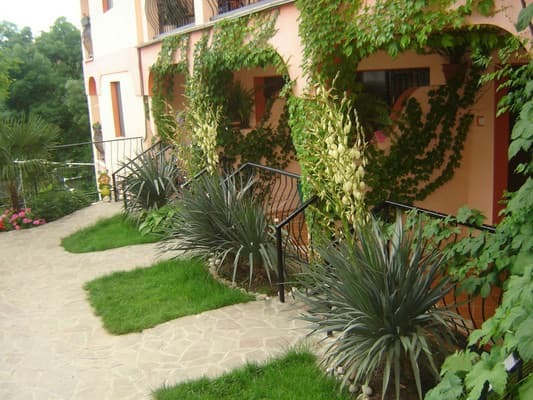 The room has a double bed, sofa, hot water round the clock, on the balcony a table with chairs. 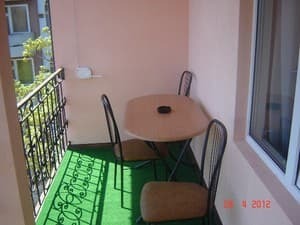 Description of the room: The room has a double bed, hot water around the clock, on the balcony a table with chairs, a balcony overlooking the sea. There is a kitchen for cooking for 1-4 people. Description of the room: Two-room suite with separate rooms can accommodate 4-5 people. 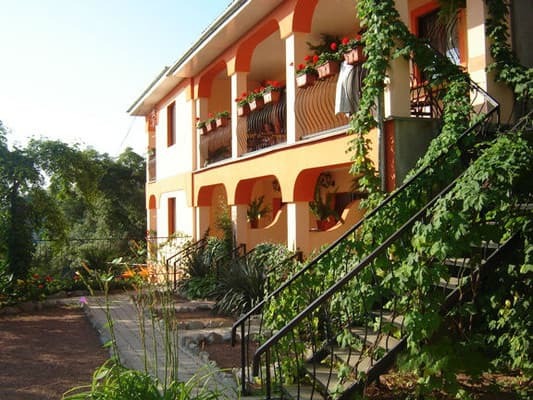 The room has hot water round the clock, on the balcony a table with chairs, a balcony with a sea view, a set of dishes. An extra bed for children is provided free of charge. 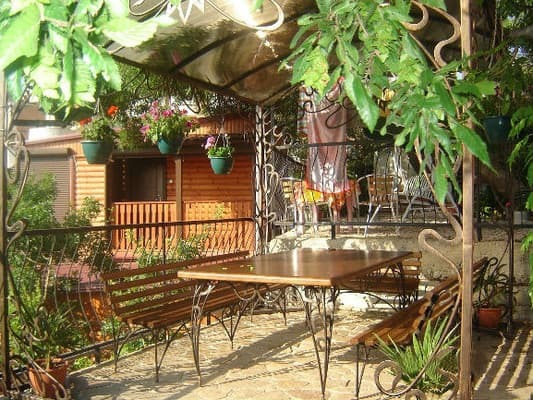 Private sector "Harmony" is located in the working area of ​​Alushta, is located 300 meters from the sea, away from the road, near the forest zone. 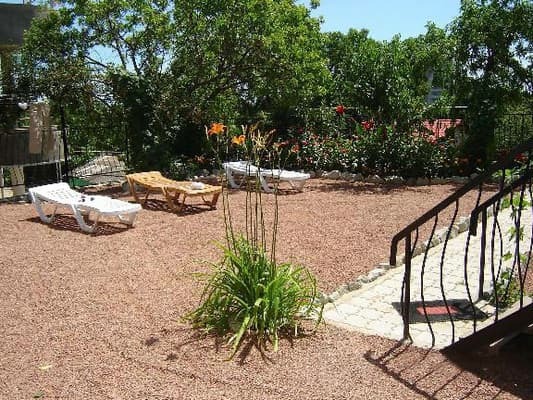 500 meters from the water park, 100 meters from the bowling center, 500 meters from the Medical Spa center, 200 meters away are shops, cafes, a grocery market. Along the embankment 20 minutes walk to the center of Alushta. Diseases of the respiratory organs of non-tubercular nature, physiotherapy, inhalators, phytotherapy cabinets, psychotherapy, speleotherapy, ozokeritotherapy, dentist's office, gymnastics room. By train or plane to Simferopol, then by bus or trolley bus to the bus station of Alushta, then by trolleybus or shuttle to the Professorial (Work) Corner, Komsomolskaya Square - from it 150 m to the sanatorium "Alushta". Hotel "Harmony" is located near this sanatorium.